Sun Lovers Rejoice! Our Sun Love Sunscreen is Finally Available! Annmarie Skin Care > Organic Skin Care Products > Sun Lovers Rejoice! 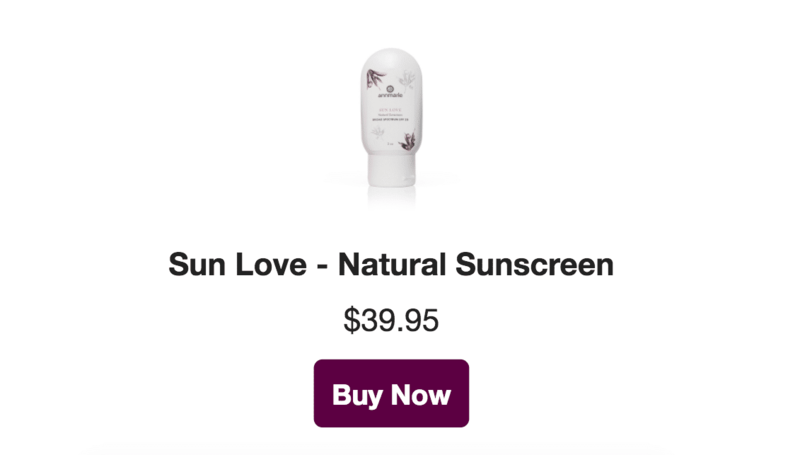 Our Sun Love Sunscreen is Finally Available! We’ve been working on perfecting our Sun Love formula, testing and retesting different batches to get the perfect consistency and potency. We’re so thankful to all of you for your patience while we’ve been toiling away and we’re thrilled to say that it’s finally here! You know that we’re always committed to having completely natural ingredients and the standards for our sunscreen isn’t any different. Although they’ve changed, the ingredients are just as pure and sustainably sourced as the rest of our products. We were able to keep the same easy-to-apply packaging and increase the shelf life of the Sun Love but almost everything is different—including our new SPF 20 rating! Here are the details on the changes we’ve made. The new formula has a smaller ingredient list than the old formula but it is no less potent. Rather than creating a new emulsified formula with water and oil, we found a way to remove the water all together so that the Sun Love is a mixture of oils, zinc, beeswax and essential oils. This gives it a new, creamier texture and it increases the shelf life. We use 15% non-nano zinc oxide to give the Sun Love its sun protection factor (SPF) and (along with beeswax) it adds the thick texture so that it will stay on top of the skin. For the oils, we’re using a luxurious blend of sunflower, pumpkin seed, hemp seed, olive, sea buckthorn berry, and buriti fruit oils to make the Sun Love an amazing moisturizer along with being high in essential fatty acids, beta-carotene, vitamin E, C and other antioxidants that protect from oxidative stress. The blend is formulated to be great for all skin types so that the moisture absorbs well without causing dryness but it also doesn’t exacerbate oily skin and clogged pores. What will be familiar to you Sun Lovers is the color! We use mineral oxides (just like in our makeup) to give the Sun Love a little bit of a tint so that the zinc oxide content doesn’t sit on your skin and cause you to look totally bleached! Of course, if you’re wanting it to be even closer to your shade, we suggest using it with our powder foundation—the new texture lends itself well to blending with the Minerals by Anmarie Foundation! Our COO, Rachel, walked into her office the other day and half of the team was standing there blocking the way to her desk smelling the backs of our hands and rubbing our arms—this was, of course, very serious business and we promise there was no laughter involved… okay, there’s always laughing but we were testing and discussing the feel of the new Sun Love so we could tell you about it! The new formula comes with a new feel too and we can’t say enough about how good it feels! It glides on smoothly for easy, flawless coverage. The new Sun Love sits on the skin nicely and it spreads easily with no worries about it balling up if you rub it too much. The creamy texture makes it easier to use with makeup and other skin care products than the old formula and it's easier to re-apply when you’re in the sun. The zinc and the beeswax in this formula make the Sun Love thicker than our typical moisturizer but the oils in it absorb into the skin really well, leaving your skin feeling silky. Because it is made to be a physical sun protection product along with being a moisturizer, it sits nicely atop the skin and does need to be reapplied every one-two hours. Zinc oxide is one of the safest and most effective ingredients for sun protection because it blocks both UVA and UVB rays. Because it is a physical protection product, zinc needs to sit on top of the skin to be effective, it isn’t waterproof and it does wear off after a time. It also needs to be reapplied every hour or two if you’re in the sun. We made the decision to have our new Sun Love tested for its SPF so that we could officially call it a sunscreen! Our SPF rating is officially 20, which makes it perfect for everyday use. To use this Sun Love, you’ll want to spread it evenly over your skin. You do not need to rub it in too much but you want to rub it in enough so that it looks nice and feels comfortable. Remember that zinc oxide is a physical sun protection ingredient, so it does need to be on top of the skin for it to be effective. The Sun Love is designed to use daily on your face because of the tint but using it on your body when you’re being active is wonderful too! It’s especially nice on the neck and shoulders if you’re going to be playing on the beach, gardening, hiking up a mountain, or anything else that puts you in direct sun all day. Make sure you’re reapplying every hour or two and covering up any part of your body that you’re not using sun protection on. Do you use our Sun Love Natural Sunscreen? We'd love some feedback. Please share your experience in the comments! It seems to separate in the tube. It feels good on the skin however living in Florida I wouldn’t mind a higher SPF than 20 as I have noticed the sun is really damaging my skin down here. I really wish I could share your enthusiasm for the new Sun Love, but I actually much preferred the old formula. The new formula does not sit well on my skin and looks very unnatural, is excessively oily for me, wipes off on clothes too easily, does not absorb well and tends to separate apart in the tube with clumps of solids not blended with the oils. I don’t know if I got a bung batch or something, but the full size tube that I bought a few months ago is sitting neglected in my skincare kit and I have now switched to another brand of organic sunscreen. One of the reasons I don’t wear makeup is that I don’t want it rubbing off on my collar. i’d try your Sun Love sunscreen if it was not tinted. I for one would have liked it if you left the water in the formula as my skin can be quite dehydrated and the extra light hydration from this was always a bonus. Also not sure on the beeswax after reading another product about it potentially be irritating on sensitive, breakout prone skin. Will give it go though later on this year as I still have a the full sized Sun love in the old formula, which I got from this website which was stocking Sun love whilst you lot weren’t. To anyone interested, the old formula is available on be good orgamics. Is this product safe for children/babies? I don’t know enough about essential oils to know which ones are safe and which ones are not. Sounds like a lovely product. Live in a sunny South Africa. Would love to try the product. What is the price? Are there stockists in South Africa. Would I use this in the winter also, or is it mostly for summer sun? It’s important to protect your skin when you’re in the sunshine, regardless of the temperature outside. While I think it’s great that you periodically reformulate products to make them better, it’s too bad you felt the need to add beeswax to the new Sun Love. I have enjoyed using the old Sun Love, as it’s the first sun product I found for my face that doesn’t seem to irritate or breakout my sensitive skin, but I won’t be repurchasing the new, non-vegan version.